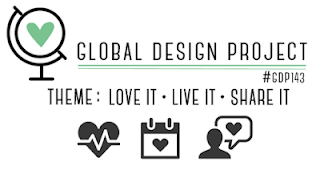 This week's Theme Challenge at Global Design Project is Live It, Love It, Share It. Such a perfect theme for the card I've created here! I just love being able to create unique, personalized cards for friends and family to celebrate the special events in their lives. 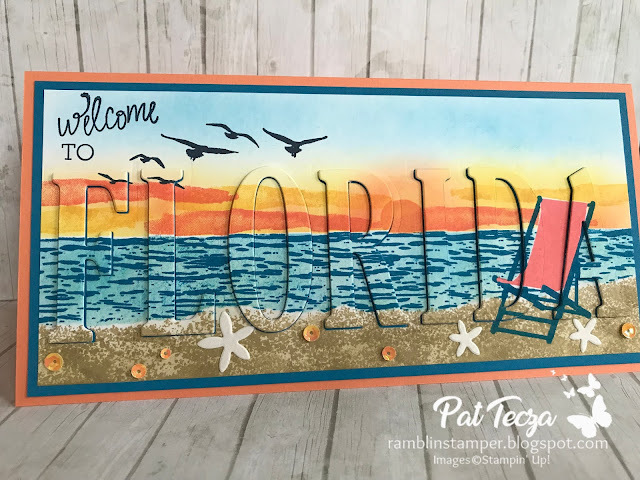 My friends Cindy & Ken recently moved their home lock, stock & barrel from Pittsburgh to Florida and I can't wait to send this card to them! I'm pleased to announce that this card was chosen as a winner for #GDP143! My sincere thanks to everyone at Global Design Project who made this possible! This Eclipse card looks complicated, but it's really not when you break it down step by step. I love the vibrant colors that perfectly capture a Florida beach sunset! Follow along as I explain how it's done. Begin with a piece of Whisper White a little larger than needed so you can trim the edges when you finish sponging. This gives your card a clean, professional look. I wanted my finished panel to be 3-5/8" x 7-7/8", so I started with a piece of cardstock 4-1/8" x 8-3/8". This gives me an extra 1/4" to trim from each side. I chose this size to fit "FLORIDA" across the card front. 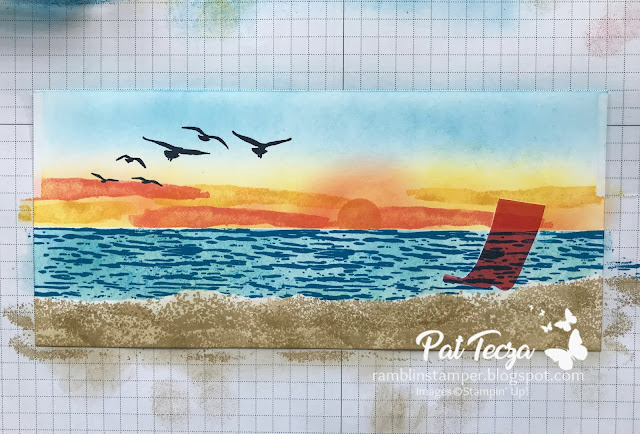 The first step is to stamp the seat of the chair (Colorful Seasons stamp set) in Flirty Flamingo. 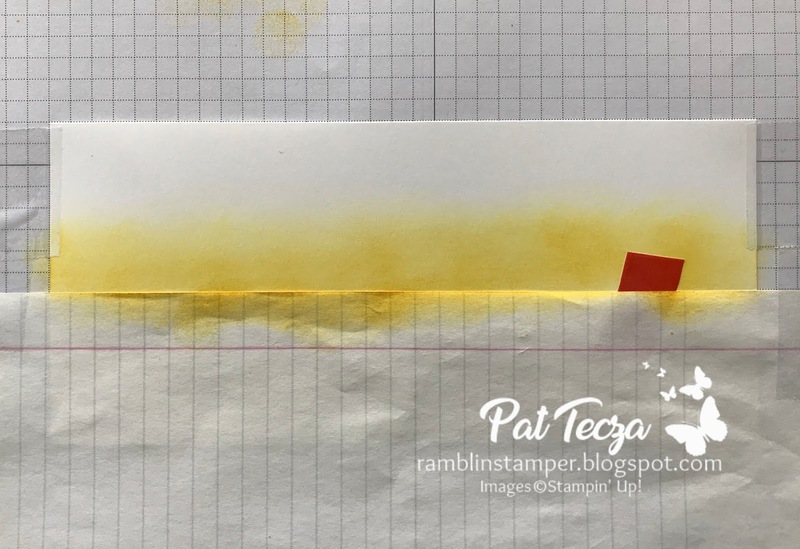 Stamp it again on a Post-It note and fussy-cut around it to create a mask. Place the mask on the card over the stamped image. 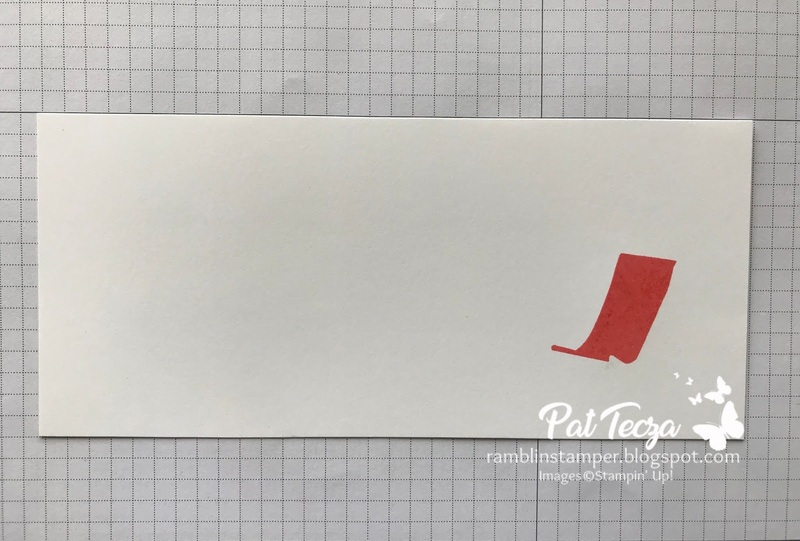 Take a piece of scrap paper and tape it down covering the bottom half of the card. Tape the card along the edges, too. Remember, you're trimming this down when you finish so tape marks won't matter. 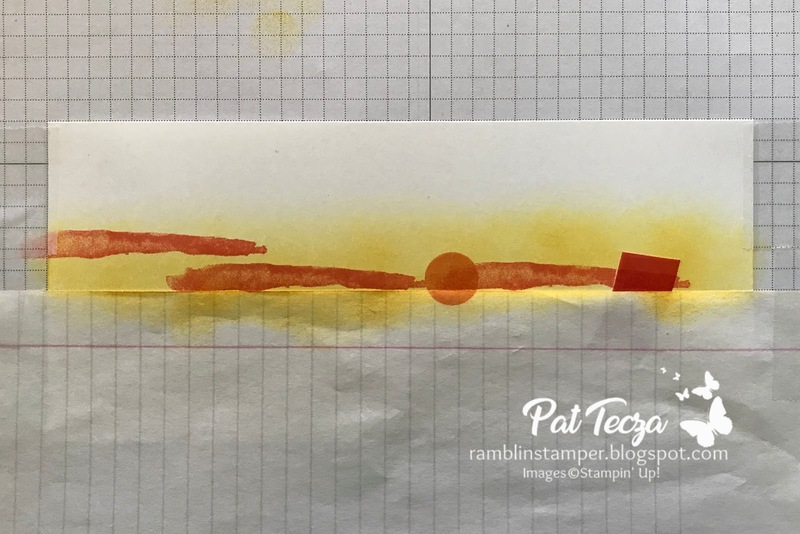 Sponge on Daffodil Delight ink. 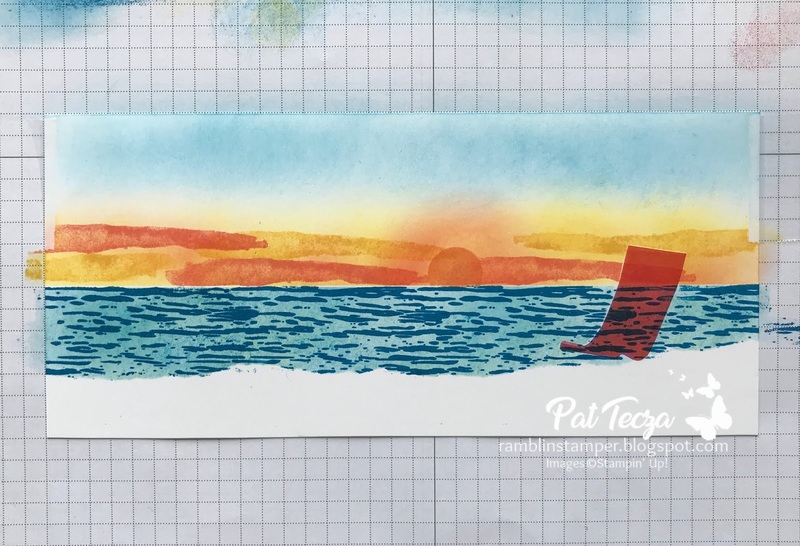 Add the setting sun (High Tide stamp set) using Grapefruit Grove ink. Add some streaks of color to your sunset using this image from the Waterfront stamp set and Flirty Flamingo ink. Add a few more streaks of color using the same image with Daffodil Delight ink. Use a sponge dauber with Flirty Flamingo ink to create a halo around the sun and sponge some more Flirty Flamingo throughout your sunset. Sponge Pacific Point on the rest of the sky. Remove the scrap paper from the bottom of the card - here's what you have so far. Tear the edge of a piece of scrap paper. 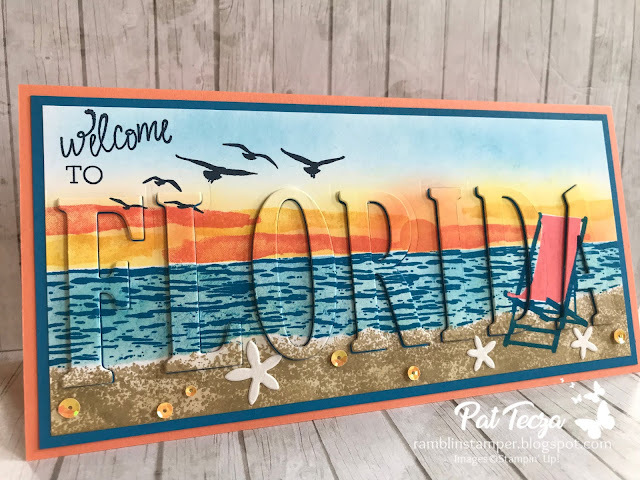 This will be the edge of your sandy beach. Tape it down again as you see here. 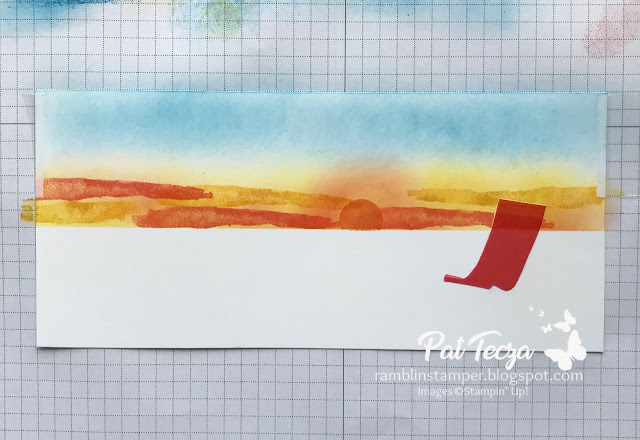 Now cover the top half of your card with scrap paper to protect your sunset. Only the ocean section of your card should be exposed. 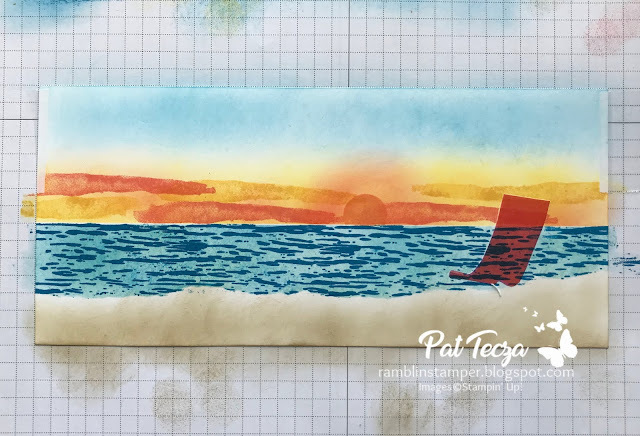 Using sponge daubers, randomly add some Pacific Point and Pool Party inks. 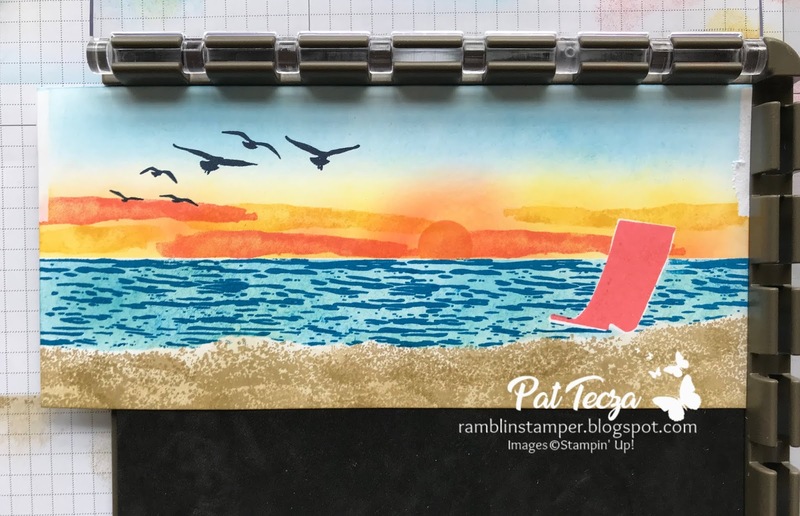 Stamp the waves (High Tide stamp set) using Pacific Point ink. 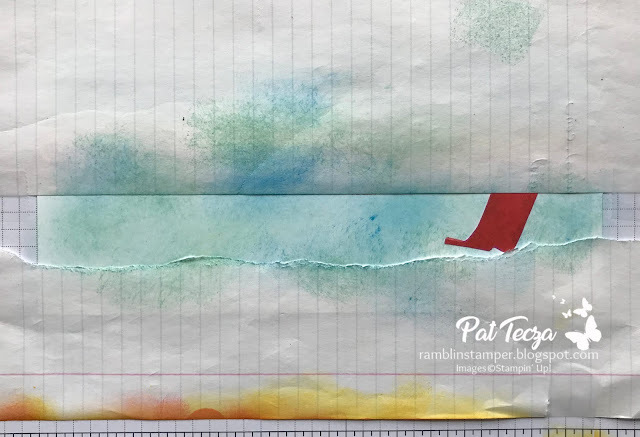 Remove both pieces of scrap paper - here's what you have so far. Looking good! Don't remove the mask from the chair yet. 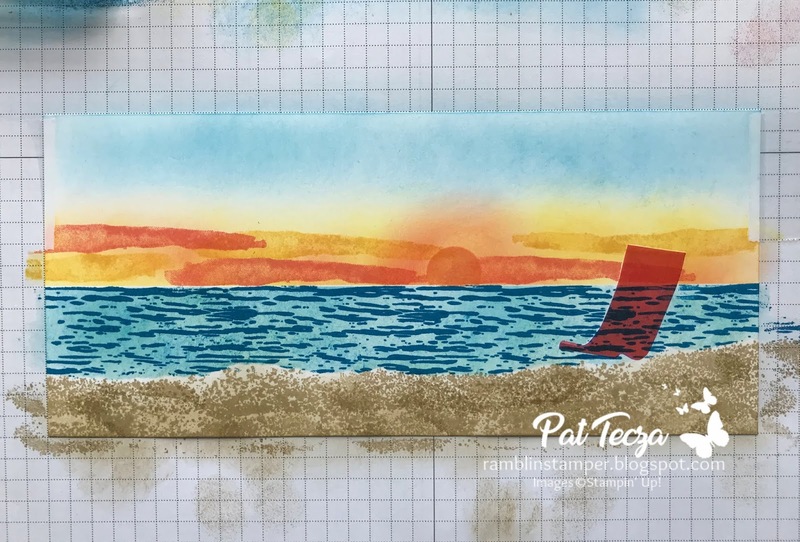 Using a sponge dauber, add some Sahara Sand ink to create your beach. High Tide has 2 sand images. 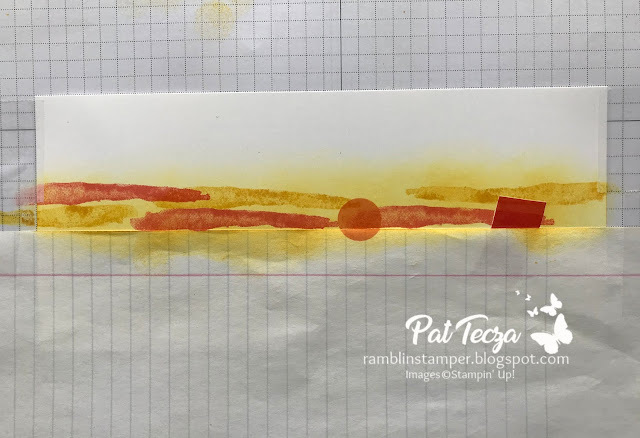 Using Sahara Sand ink, I stamped the larger one several times and used the smaller one to fill in empty spots. The seagulls are stamped with Night of Navy ink. It's time to remove the mask from the seat of the chair and stamp the chair frame in Pacific Point ink. I used the Stamparatus to line it up perfectly. "Welcome to" is stamped in Night of Navy. 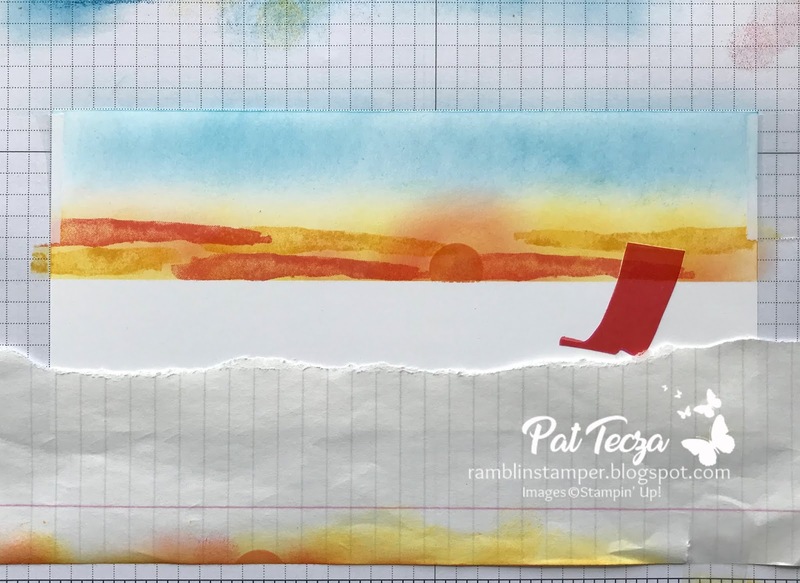 I pulled these words from 2 different retired stamp sets that I own, Places You'll Go and Crazy About You. 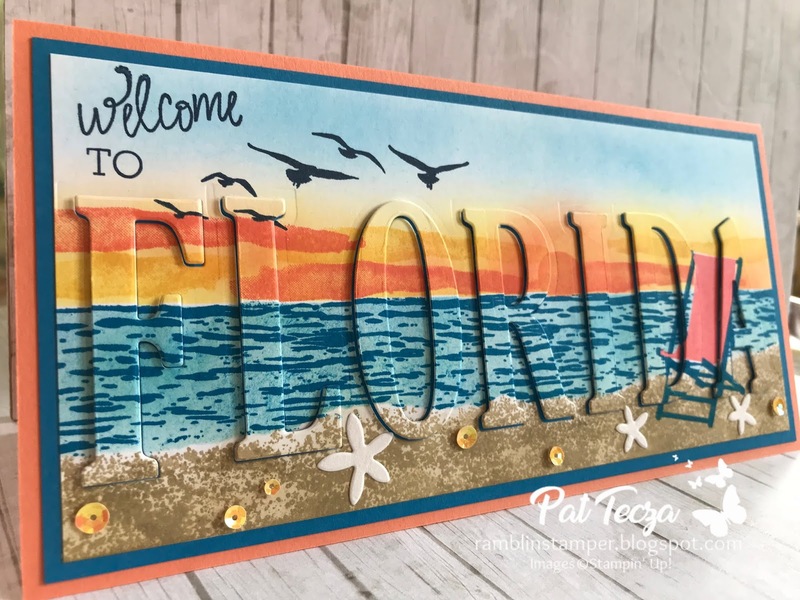 I lined up the Large Letters Framelits carefully across the card front (before assembling the card) and die-cut them all at once using the Big Shot. 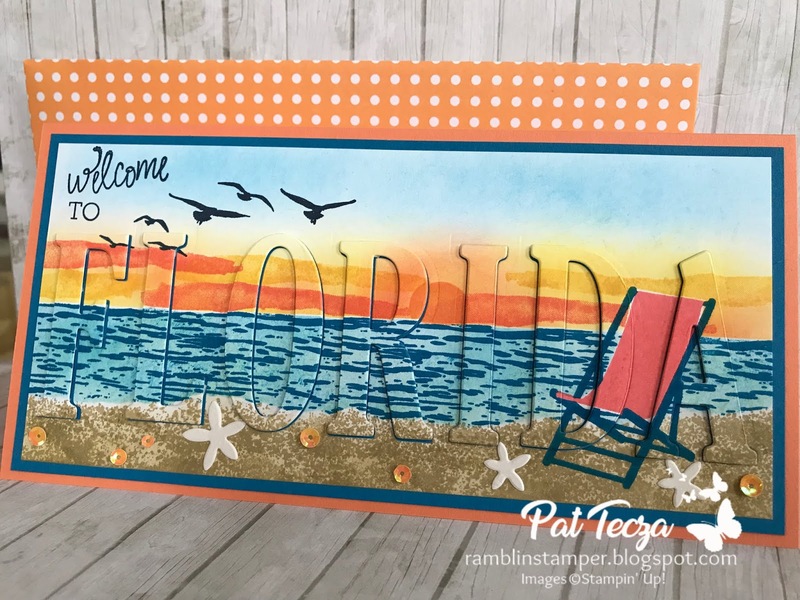 The card base is Grapefruit Grove cardstock, cut 8-1/4" x 8-3/8" and scored at 4-1/8". The mat is Pacific Point, 3-7/8" x 8-1/8". Assemble the stamped card front to the mat & the card base before adding the letters, which are adhered with Mini-Dimensionals. The centers of the "O", "R", "D" & "A" are adhered with Liquid Glue. The starfish are die-cuts from the Under the Sea Framelits. They are actually the centers of the sand dollars! I sprinkled a few Irridescent Sequins across the beach and attached them with glue dots. 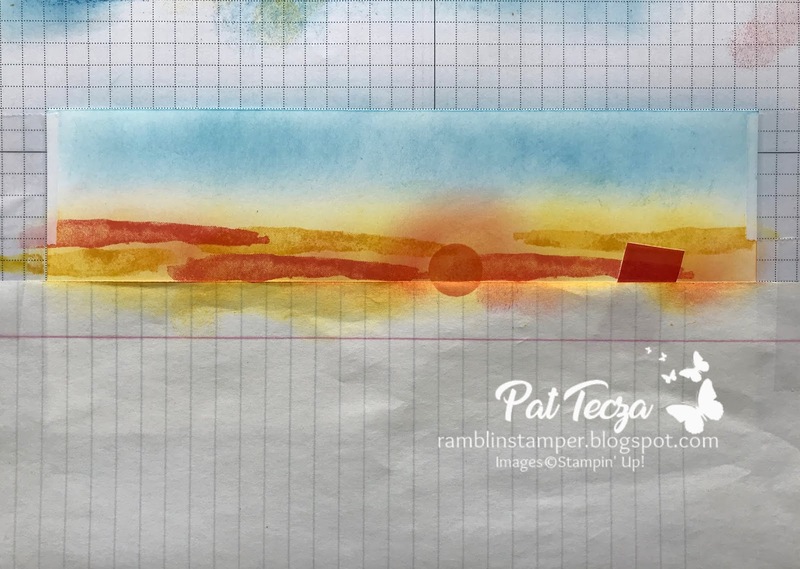 Because this is a non-standard sized card, I used my Envelope Punch Board to make a colorful matching envelope. 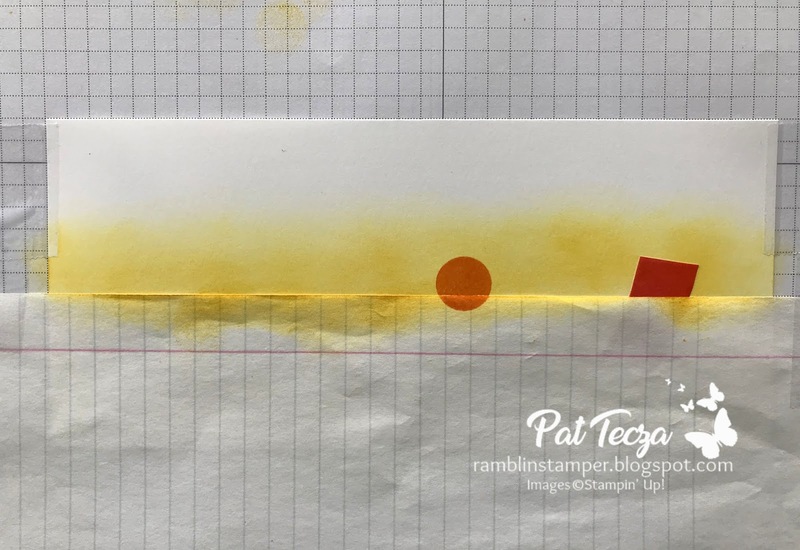 I've been making a lot of envelopes lately to use my retired designer papers! 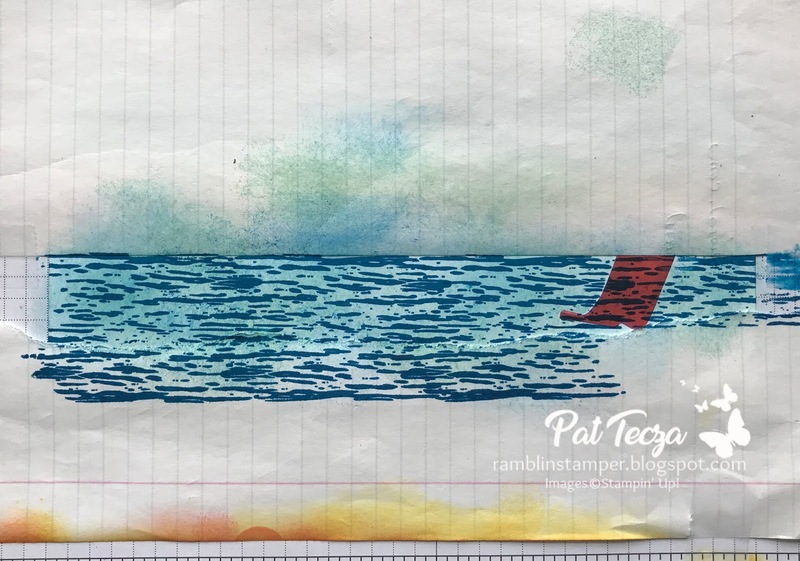 I'm celebrating my 3 Year Anniversary with Stampin' Up by giving away the Sea of Textures Bundle which includes the Sea of Textures stamp set AND the Under the Sea Framelits! On July 1 I'll randomly choose one person from my blog followers to receive the bundle as a thank-you for your support. Enter your email on the left side of this page right below the catalog image for a chance to win!